RALEIGH, N.C., CHARLESTON, S.C. (Reuters) - Communities in North and South Carolina along waterways to the Atlantic coast faced rising floods on Saturday more than a week after the arrival of Hurricane Florence, which has killed at least 40 people. Officials in towns and cities in both states were filling sandbags and finalizing evacuation plans, eyeing some rivers that are swollen by heavy rainfall but not expected to crest until Sunday. In Conway, South Carolina, where President Donald Trump visited this week, images posted by the city on Saturday showed water lapping at homes in an area where residents were being evacuated. In Lee's Landing in Horry County, some residents used boats to get to safety as the Waccamaw River spilled into neighborhoods, a local CBS affiliate reported. "If you can get out, get out," Joseph Tanner, the county's fire rescue chief, said in an interview with WBTW News 13. More than two dozen flood gauges in North and South Carolina showed flooding on Saturday, the National Weather Service said. At least 40 deaths have been attributed to the storm, with most of those in North Carolina. About 5,000 people across North Carolina have been rescued by boat or helicopter since the storm made landfall, twice as many as in Hurricane Matthew two years ago, according to state officials. Thousands of people remained in shelters. Nearly 550 roads remained closed, the state's department of transportation said, warning motorists not to travel in 17 southeastern counties worst-hit by Florence. 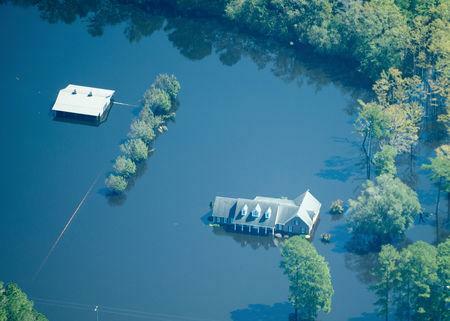 The flooding from Florence has also caused 21 hog "lagoons," which store manure from pig farms, to overflow in North Carolina, possibly contaminating standing water, according to state officials. North Carolina is one of the leading hog-producing states in the country.